Souviner Card – A precious survivor – Reproduced with the kind permission of Jack Moore – son of original Sapper John Hoey Moore DCM – see below for the list of signatures. The Afric No. A19 was a 12 thousand ton transport ship embarking from Sydney carrying units of the 1st Australian Division, including the 1st Battalion Infantry, Army Service Corp. and Engineers. It was among the first fleet of eleven ships designated to embark troops and horses in Sydney. The final count was made up of 48 officers, 1372 men and 8 horses. On Sunday the 18th October 1914 the men of the First Field Company Engineers were finally ready to embark for a seven week voyage at sea. A few false starts and weeks of delays, the loss of one of its original members and 8 weeks of training, finally the men were about to head off for the great adventure. The drum beat sounded – Reveille – at 5.00 and the 1st FCE broke camp at Moore Park and marched to the trams to take them to the wharf at Woolloomooloo Bay and then they were taken by Ferry to board the troopship A19 – Afric. 53 Thomas Drane in his diary mentions the large crowds of people waiting at the Quay and the police having to hold them back and 29 Bob Lundy described a similar scene with bands playing, flags waving and large crowds cheering. The Afric left Sydney at around 5.00 pm. It was raining heavily and they were experiencing gusty winds and rough seas. Many men at sea for the first time were sick as soon as they had left Sydney Heads. The ferry whistles, launch sirens and all the farewell cheering and music had faded in the distance and now as Spr. Roy Denning described, everyman was now silent, occupied by his own thoughts. The souvenir card pictured above is a precious moment from the past. From the private collection of Jack Moore , son of 101 John Hoey Moore, he has kindly provided a high quality digitized copy of the card showing many of the originals signatures. On the back of the photo John has written “This photo has survived a fire and a flood”…. John at the time could not have envisaged it surviving the war and a further 100 years. The men of the 1st FCE were finally on their long-awaited voyage and after a rough and tumble start they were headed with the fleet of the 1st Australian Expeditionary Force to Albany in Western Australia where they would be joined by the New Zealand Fleet. From the pages of John Hoey Moore, Ernest Murray’s letters and diaries and the correspondence from the enthusiastic Ernest Tubbenhauer it’s possible to recapture some of the spirit of the 1st FCE and the troops on their voyage on the Afric. ‘We sailed on Sunday afternoon at about 5 o’clock, and cleared the Heads about 5.30. The sea was very choppy, and the majority of troops were soon sick, including myself. Seasickness is a ‘lovely’ sensation. I was bad on Sunday night and Monday morning, but on Tuesday I ‘was right’ and am eating like a tiger now. As soon as I was right I hunted up the printing office, and got a place on the staff, and have been working hard ever since. We are bringing out a daily ‘rag.’ It is the biggest paper ever printed at sea. There are five off us working in the office, and we have a fine little plant. Part be longs to two of the chaps working in the office, and part was given by the State Government printer, Mr. W. A. Gullick. ‘We are just nearing Albany, and have to have our letters ready for post by 6 o’clock to-night. There are over 1400 troops on board the Afric— about- 1000 Infantry (including Harry Collins), 200 Engineers, and about 240 Army Service Corps. We are having a tip-top time — plenty of games and reading. The parades are very light. There is not enough room to do much work. We have to get out at 6 o’clock and fold hammocks; physical exercises 6.30 to 7.30 a.m.: break fast 7.30; parade 9 to 10.30; knotting and splicing 11; fire drill; dinner 12 noon; parade 2 to 4 p.m. (semaphore signalling), tea 5 ; swing hammocks 7; lights out at 9;15. That includes the day’s work. I am exempt from all parades to work in the ‘Kangaroo’ office. ‘We expect to be at Albany for A couple of days. The ‘Kangaroo’ was a single sheet, about the size of a sheet of the “Herald,” and was printed on one side generally in the style of a six columned newspaper. It was printed on a cotton rectangular tabby weave fabric and printed with red paint. The Union Jack and the Australian flag were pictured in the heading, and a kangaroo on the left gave and the emu on the right give each other a friendly glance. Below was the announcement: “The representative newspaper of the Australian Imperial Expeditionary Force (1st Battalion. 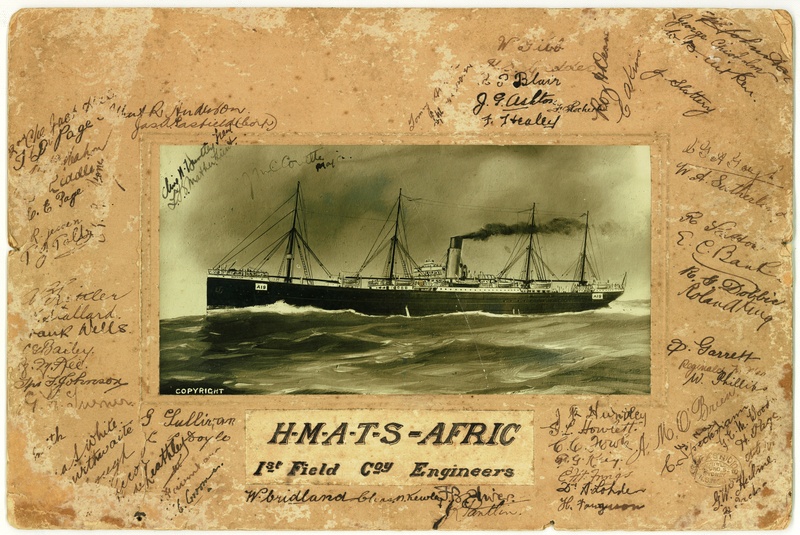 )”published on the troopship “AFRIC”. On Sunday 24th October the Afric arrived at Albany and the troops spirits were high. John Hoey Moore tells the story……………………………………..
” I watched the Maorilanders or “Pig Islanders” as the Australians call us, arrive in port. Perhaps I should have been with them for here was I, a true New Zealander, going off to war with the Australians. ” John Hoey Moore had just embraced the idea of the ANZAC spirit before it was known as ANZAC. The men had responded to the call, they had been training for weeks and now on the long voyage to war, they were allowed to let off a bit of steam while on board, hair cuts, glee clubs, a Neptune ceremony, drill competitions and boxing tournaments followed. “Time goes very quickly on board and the boys make the pace fast and positive, last night being one of the most amusing on record so far. After four weeks at sea the AFRIC had arrived at Colombo on the 15th November and within a few days they left without setting foot on land. Ernest Murray thought it was a beautiful mountainous island rich in green foliage and the bay area the same only with buildings adding colour with white walled buildings and fine hotels. Bob Lundy thought the same, admiring the beautiful scenery, the fancy large hotels with tennis courts and lawns. The next few days sailing conditions were perfect, Boxing and rifle drill competitions had taken the spotlight on board, the Engineers were favoured to win the rifle drill . The boxing tournament was also set to be a great success for the Engineers with “Maorilander” John Hoey Moore into the Semi Finals and up against another Maorilander. The big excitement for the troops surrounded the Rifle drill competitions on board. The engineers had put up two teams , A.S.C two teams and 1st Battalion eight teams. According to most accounts the Engineers came first and second place, the ASC 3rd and fourth. The division corps had easily outclassed the infantry. Ernest Murray recorded the winners in his diary and Bob Lundy must have been very pleased with the outcome as he earned top honours and it was also his birthday. According to Bob Lundy, the follow up night was a real celebration, they had a “royal time” eating, drinking, speeches and plenty of music from the “Bijou Orchestra” who gave a special concert at the sharp end of the ship. Bob said he “could not have had a better day for his birthday”. The following day on November 26th the troops on board the Afric had news that they were not going to England. 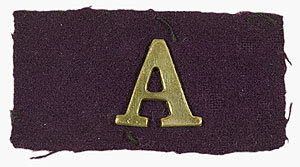 Kitchener had ordered the troops to disembark at Alexandria for Egypt to finish training there. Apparently winter conditions in England were quite severe and they would be unable to accommodate the growing troop numbers. The Great Adventure – Part 2 – Breaking Ship……….coming soon. The following is a list of signatures from the AFRIC Souviner Card – courtesy John Hoey Moore Collection. Interestingly some signatures are from a few non original members but obviously good friends of John as well as two originals on board the Clan Maccorquadale which John Hoey Moore must have obtained after the voyage. A Special thanks to Jack Moore, son of original sapper John Hoey Moore D.C.M for kindly allowing me to use his images and material from his book “Anzac Jack”- J.H Moore. “Anzac Digger” by Roy and Lorna Denning. is available from Military Booksellers and also Ebay.